The large Colorprint Deskbox is distinguished and is presented on very special occasions. 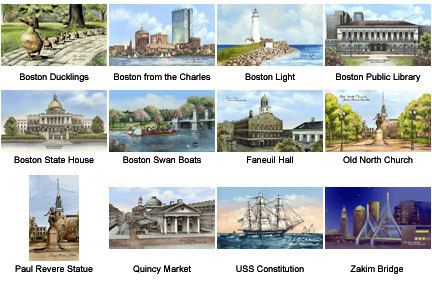 Each features a landmark print of a beloved Boston scene derived from an original Eglomis� painting. Made of solid wood, hand-finished in rich cherry tones with brass hardware. Interior lined in its own wood with a felt bottom and brass fittings. This will make a handsome addition to any desk or library. Select from among the images shown below. Dimensions: 13½" x 8½" x 2½". Also available in smaller sizes. Custom personalization is available for $15. The custom message may be up to three lines.